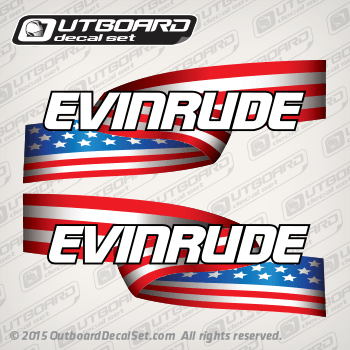 Evinrude U.S Star and Stripes American flag decal set for Evinrude Outboards. Please choose out of our various size options that will best fit your Outboard, Price vary in Size. * decal is longer than usual for some Johnson 112 SPL engines(19x6), 6-8 hp (15x4.4) and others, similar version on proportion available upon request.